LAST EDIT May 28, 2018 — Download a printable PDF of "Security Guard Test Questions and Answers PDF". Question: Where can I find the PDF with the questions and answers from the unarmed security exam? An Oklahoma security officer at work. Oklahoma is one of the states that requires officers to pass an unarmed security test prior to licensure. 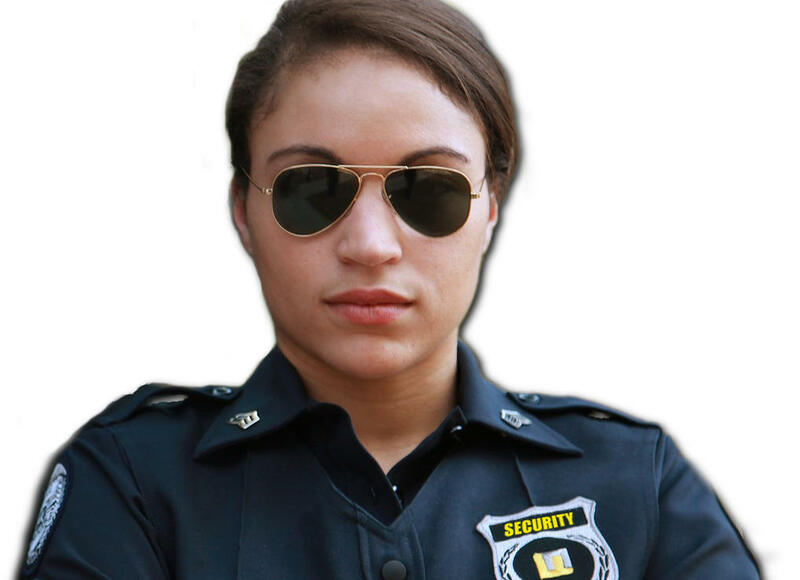 The Security Officer Network provides future security officers with a complementary PDF. 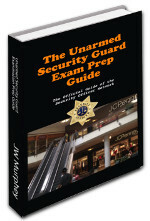 It features many of the questions and answers that you will find on most states' unarmed security exams. 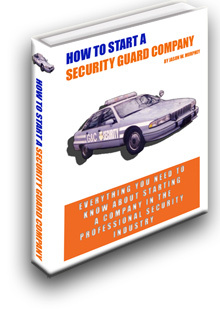 It has been used by hundreds of readers as they prepare for the unarmed security test that is required by many states prior to licensure as a security guard. You can download the PDF, known as the Unarmed Security Prep Guide, from this page. 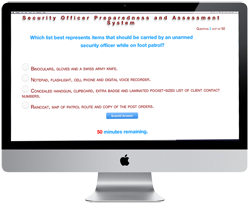 Once you have examined your PDF, you may take The Security Officer Network's unarmed practice test. Those who score a 75% or higher will receive a certificate of passage. The PDF provides an overview of the following unarmed test question subject matter as it is likely to be found on most state unarmed security tests. Covered subject matter includes the following. Officers are prepped for questions dealing with site directives and post orders, patrol, access control, radio use, maintenance, first aid and fire suppression. Subject matter includes report writing, going to court and knowing the vital difference between a "fact" and a "conclusion." Test takers must show knowledge of the importance of tactical communications, understand interview posture and articulate the arrest powers of the security officer. Readers are prepared for commonly enforced state licensing policies. The reader will find the following sample questions in the PDF. 1. What statement best describes the security guard’s authority to protect his client’s property? A. As the official representative of the property owner, the officer can deny access and evict people from the property. B. The officer has no authority to ask someone to leave the property. C. The security officer can deny access to a property only when wearing a gold or silver metal badge that says “Security Enforcement Officer”. D. Prior to an eviction the security officer must notify local police. 2. A person quickly walks through and sets off the metal detector at a small school. When asked to stop, the person declares, "This is a public building and I cannot be denied access." A. This is true, the school is a public building. A taxpayer cannot be denied access. This is why many schools do not use metal detectors; they are pointless. B. This is false, law allows the school to set an access policy and security may enforce that policy. Failure to clear a metal detector allows the school security officer to deny access. C. This is true, but the person must provide a copy of his identity before proceeding. He must also pledge to not use any weapons on his person to cause harm once he is allowed access. D. This is false, the security officer can deny access but only after checking with the local police. 3. The owner of a truck stop hires a new security company to crack down on the prostitution problem in the parking lot. On his first night, the new officer asks three presumed prostitutes to leave the property and tells them to not come back. The next night he notices one of them sneaking onto the property and trying to solicit a trucker. What can he do? A. Make an arrest for prostitution. B. Make an arrest for trespassing. C. Ask the person to leave the property. 4. What type of offense most likely constitutes a misdemeanor? A. 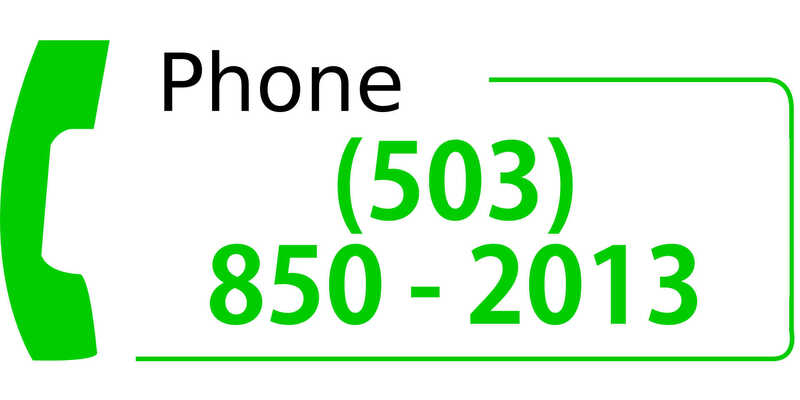 Person A viciously assaults person B causing significant injury. B. The guest at a motel refuses to pay his bill for long distance calls made during his stay. C. A group of hotel guests create a loud disturbance in the hotel parking area and the bordering public sidewalk while drinking alcohol. D. The winning bidder at a public car auction refuses to pay for the vehicle he just agreed to purchase at auction. 5. Why shouldn't the security officer Mirandize the arrestee upon arrest? A. The law does not require it. B. A citizen’s arrest adheres to a different due process than does a police arrest. C. Because Miranda notices are normally provided by a police officer, the arrestee might accuse the security officer of impersonating a police officer. 6. Why does the unarmed officer’s employer want him to “observe and report” instead of taking a more proactive role in mitigating security incidents? A. It minimizes the civil liability of the security agency. Also, the unarmed officer does not have the tools or training to make an arrest. B. Clients who pay the company for unarmed security are usually cheap and they don’t deserve the services of a highly paid armed officer who has the capacity and training to bring an end to security situations. C. Unarmed officers make great eye witnesses. D. There is so much crime that it just isn’t practical to try to stop all of it. 7. Security Officer Johnson, a security officer at a hotel, approaches a tenant who holds an open can of beer and is talking loudly and creating a bit of a disturbance in the hotel courtyard. Which dialog best represents the effective use of tactical communications? A. SO Johnson: You can’t have an open alcoholic container in a public place. It’s against the law! Tenant: What are you going to do about it big man? SO Johnson: If you don’t put it away I am going to have to arrest you! B. SO Johnson: I apologize, but the hotel has a policy about drinking outside of the bar area. Would you mind taking it back inside the bar or your room? Tenant: That’s a dumb policy! So Johnson: A lot of people don’t like it, but I get in trouble if I don’t enforce it. Tenant: It’s all right man. I am not going to get you in trouble. I’ll go back in. C. SO Johnson: You are breaking hotel policy. Pour that beer out right now or we are going to evict you! Tenant: Make me! D. Tenant: What do you want? SO Johnson: What do you mean what do I want? You are the one who is breaking the law. I want you to obey the law! 8. What steps should the security guard take before he goes to court for either a deposition or witness stand testimony? A. Call the attorney for the defense and ask for an advance copy of all questions that will be asked. B. Review the incident report and all subsequent documents. D. Carefully coordinate testimony with the prosecution to ensure everyone is on the same page. 10. 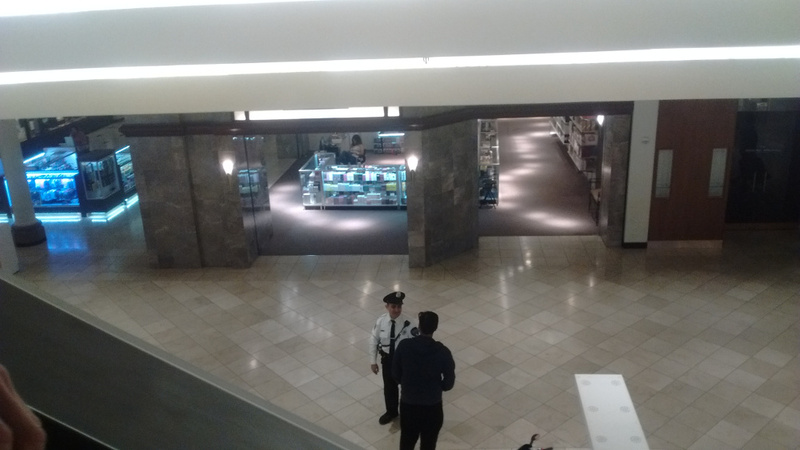 During his shift, the security guard must practice situational awareness. Which statement best defines situational awareness? A. Situational awareness occurs when a security guard asks his supervisor what he thinks of the guard’s on-the-job performance. B. Situational awareness is a self-assessment process designed to ensure the officer is prepared for a security incident. C. Situational awareness dictates that an officer constantly monitors his surroundings and is aware of his conditions. D. An aware security guard should always know how to isolate an aware individual. The answers to these and many other questions are found in the Security Guard Test Questions and Answers PDF from The Security Officer Network.